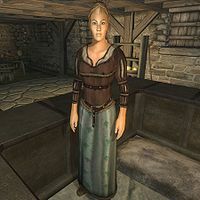 Nerussa is the Altmer innkeeper at the Wawnet Inn near Weye and the Talos Bridge. She sells food and rents beds to travelers. She is also an avid wine collector and during the related quest you will help her add the notoriously rare Shadowbanish Wine to her collection. Nerussa wears a brown shirt, a green silk garment and a pair of pigskin shoes. Nerussa lives her life offering her services at all hours, except when she sleeps on the bedroll behind the counter between midnight and 4am. As she’s always on the lookout for fellow wine enthusiasts, she will greet you a bit differently than other innkeepers: "Welcome to the Wawnet Inn. Could I interest you in a room or perhaps a bit of wine?" If you take the room she will just be formal and point you in the right direction: "There’s a fresh bed available to anyone who’s got the 10 gold. Would you like it? So be it. Head upstairs, and look for the last door on your right. That’s your room for tonight. Sleep well." However, if you ask her about wine, she will lighten up and be all over you: "Yes actually, I’m quite fond of collecting all manners of wines from all over Tamriel. But one vintage continues to elude me: Shadowbanish Wine. How I’d love to add it to my collection. Say, that gives me an idea. You look like the adventuring type. If you can retrieve six bottles of Shadowbanish Wine, I’ll gladly pay you well. All I know about them is that they’re found in the many fort ruins scattered all over Cyrodiil." When you ask her about that particular brand, she will give you the whole background story: "Well, apparently the wine is so rare because it was only made in one tiny batch. It’s the product of an alchemist who was also a vintner. Besides tasting incredible, the magic within the wine allows the imbiber to be gifted with Night Eye! The vintner made it special for the Legion soldiers posted at the forts when they were active long ago. It was perfect for keeping lookouts warm on cold nights and helping them see better in the dark. Clever, eh?" When you return with a satisfying stock of the rare wine, she will be amazed: "I’m at a loss for words. You actually found six! These will hold an honored place in my collection! I don’t know what else to say but thank you. Oh! I almost forgot. Here’s your finder’s fee. Worth every single coin, I assure you. I’ll tell you what else I’ll do since you seem so resourceful. If you find any more bottles of the wine, I’ll gladly pay you well for them." If you've found a bottle of Shadowbanish Wine by accident, she will be delighted and task you: "By the Divines! You found some? Fantastic! Hang onto it for now. I must have six before I’ll be truly satisfied. Then I’ll have more than anyone else in Cyrodiil!" Esta página foi modificada pela última vez à(s) 04h02min de 27 de maio de 2013.